Sale is held behind the fairgrounds, look for signs. Zettlemoyer Auction Co. Auctioneers. Five auctioneers. to 7PM. No items accepted on day of sale. CONTACT: For information or to consign call 570-402-7333 (club phone). Jacob Kresge, 6, had a grand time imagining he was plowing a large field on this McCormick Farmall tractor at the Pocono Old Tyme Farm Equipment Association consignment sale held at the West End Fairgrounds. He likes coming to the sale because of the tractors. He was with his dad, Jon Kresge of Brodheadsville who says, "I'm always looking for something to buy and always selling something." NEW WEBSITE! 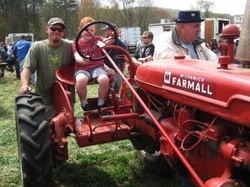 The Pocono Old Tyme Farm Equipment Association was formed to promote the interest of the public in the preservation, restoration and education of antique tractors, implements and toys.